One of my favorite benefits of EfM this past year has been time for bible study, both independently and in community. Having the opportunity to read the bible along with corresponding research, scholarship, and historical information and then getting to discuss it with others has been so good for me. Now that I’ve gotten used to this practice and started setting aside the time for it each week, I’d like to continue bible study over the summer. EfM will pick up with the New Testament in the fall, but I don’t want to lose the habit of spending time not only in a devotional but also in study. I saw on Instagram that LifeWay was offering two online bible studies over the summer and that one of them was by Angie Smith. 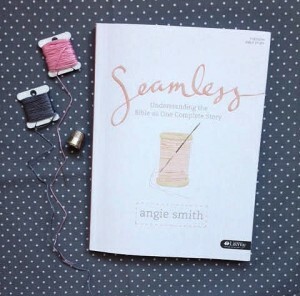 Angie Smith’s books are some of my favorites, and I’d been looking forward to Seamless since hearing about it a few weeks ago. LifeWay is hosting the online bible study on their blog (read more here). The timing of it is set up so that you can make it work with your schedule, which is perfect for summer travel plans. 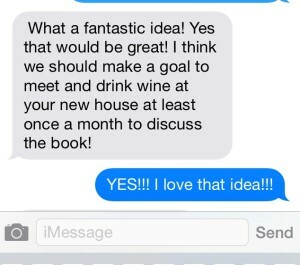 I asked one of my dearest friends if she’d be interested in joining, too, so that we could create community not only online but also in person. She hopped right on board. Love that girl. How about you? 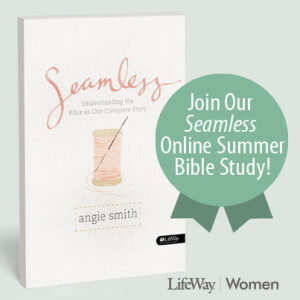 Would you want to join LifeWay’s Seamless study, too? I’d love to chat about it with you guys! Let me know if you’re in. Totally unnecessary PS: I always feel like posts with links and sort of a “hey, you should purchase this!” tone are sponsored and understand that some blog readers are turned off by that, so I felt obligated to tell you this is in no way sponsored. I paid for the book myself and everything. I know it’s hard to believe that no one’s paying me to take these poor iPhone photos of their products, but it’s true. ; ) Okay, carry on.